What does Toronto’s CN Tower and Canada’s lottery system have in common with the Leduc Outdoor Farmer’s Market? They all began forty years ago in 1973! Originally the market was held inside the Alexandra Arena, but in 2001 while repairs were being made to the arena the market moved to the park outside. This was so popular with both the vendors and the public that it has remained in the park ever since. 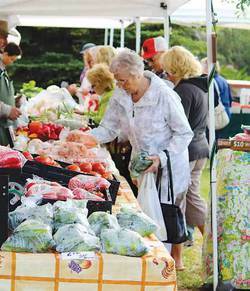 Farmer’s markets have been a favored Alberta activity since the early 1900’s, however it was not until 1973 that the Alberta government established the Farmers’ Market Program and formalized the markets. The major benefits that draw consumers is the opportunity to purchase fresh food that has been picked in the last twenty-four hours and haven’t spend hours, if not days on a truck to reach market. The additional advantage of farmer’s markets is the locally grown vegetables are chemical free and environmentally friendly. At the same time residents are supporting local businesses and help stimulate the local economy. Farmer’s markets have expanded to beyond offering fresh food. It is also an opportunity for the public to observe and purchase crafts made by local artisans. In recognition of the Market’s 40th Anniversary a number of the vendors contributed to three baskets full of goodies. The Market is open every Thursday from 10am to 1:30pm beginning in May and ending in October.